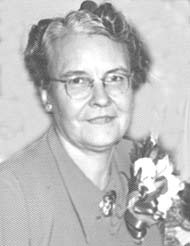 Sadie Mary Trombly was born on 9 February 1895 in Detroit, Wayne, MI, the eldest child of Alfred Columbus and Rose Susanne (Rivard) Trombly. She was christened Mary Sarah Trombly on 17 February 1895 at Assumption Grotto Church, but all her life was known as Sadie. Being the first child, her father had hoped she would be a boy, but he soon came to cherish her and knew he could always depend on her. Sadie's paternal grandmother was delighted to have a grand-daughter, since she'd only had boys. 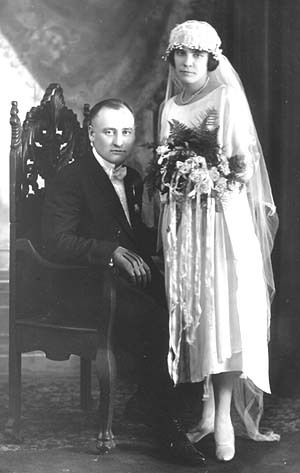 She married Joseph Francis Schulte, son of Anthony Schulte and Wilhelmina Knoche, on 7 September 1921 at Assumption Grotto Catholic Church in Detroit. Father Joseph S. Marx performed the ceremony. She and Joe renewed their vows in 1971 at St. Margaret Catholic Church in St. Clair Shores. After the ceremony, a 50th Anniversary party was held for family and friends at the Knights of Columbus Hall in Roseville. 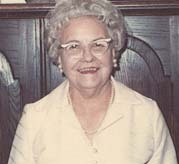 Sadie was a witness to the marriages of her first cousin, Rose Marie Rivard, to Francis E. Rivard, second cousin one time removed to Sadie; and her brother, Eugene Trombly to Stella DaFoe. Photos of Sadie reveal a lady who enjoyed her long life and portray her beauty. 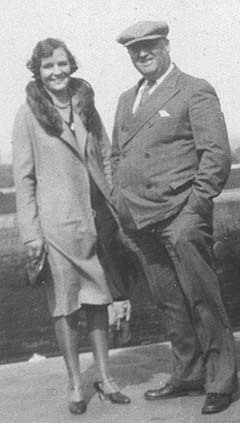 She and Joe corresponded during the Great War, when he was in France and wrote home of seeing Notre Dame and walked the land of Sadie’s ancestors, but those letters referred to in Joe's war diary have not been found. Sadie eagerly kept up her correspondence with many friends and relatives well into her later years. Sadie was an excellent seamstress. She made daughter Rosemarie's wedding dress and the bridesmaid's dresses and even made miniature versions to place on keepsake dolls. She also made Mariana's and Darleen's First Communion dresses. When her oldest grand-daughter, Mariana, was about 18, Sadie taught her how to crochet granny squares. The home of Sadie and Joseph Schulte was always open to relatives who needed a place to stay. In 1938 after her brother Alfred's wife died accidentally, he and his three young daughters became a part of the household. Jackie, Bevy and Gloria were cousins of Rosemarie, but they grew to think of each other as sisters. Grand-daughters, Mariana and Darleen, would usually spend a week in the summer, going bowling, visiting Uncle Frank Schulte's farm, playing cards. Sundays and holidays were spent at the cottage by the Clinton River and out on Lake St. Clair on Joe Schulte's boat. 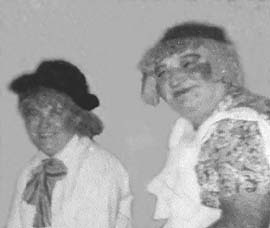 Lots of parties were hosted by Sadie & Joe, including Halloween and New Year's eve. Her parent's enjoyment for traveling was shared by Sadie. She was pleased to accept invitations to go visit relatives in Florida or go up north with her brother, Otis, and take trips with the St. Margaret's senior citizen group. Sadie accompanied her daughter and family to the Detroit Zoo, Greenfield Village, and on many other outings. 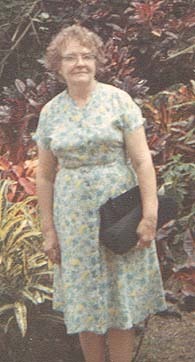 Her sisters, nieces, nephews, cousins and friends sought out her company on their excursions and as a welcome guest in their homes in MI and FL. Sadie was a member of the Schulte Card Club and also played cards with friends. In October 1981 Sadie went with a tour group to Rome, which included Liz Edgar, a neighbor of her daughter's - they were thrilled to have the opportunity to see the Pope. 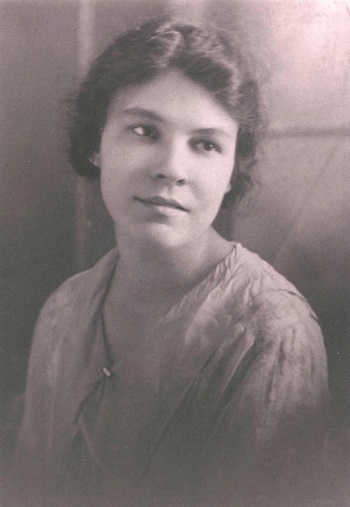 Sadie's faith was a central part of her life. She and Joe attended Mass every day. Her grand-daughters often accompanied them when staying over for a visit. Mariana was proud to have her grandmother as her Confirmation sponsor and when she was old enough to drive, Mariana escorted her grandmother to the Stations of the Cross on Good Friday. Her church and the Red Cross were thankful for the time she volunteered. Sadie was well known and loved, being warmly received at all events. She was also active with the Red Cross in Roseville for the last 15 years of her life. Sadie relished walking to any destination, even if it involved many miles, and continued to do so all her life. She did not want to be what she considered a burden to anyone, so she would set out on her own. One wintry morning in early 1977, while she was on her way to church, a car slid on the ice, knocking Sadie to the street. She was off her feet for quite a while then, a condition she did not like. Sadie recuperated at the home of her sister, Marcella Banach. She was grateful for all the support she received, but was glad to get back to her own home, where she could hang her laundry to dry in a fresh breeze, and plant her vegetable garden. In November 1982 Sadie was diagnosed with breast cancer, for which she had radiation treatment. 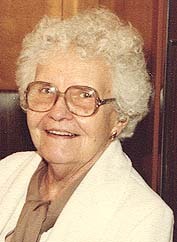 Late in 1984 she became a hospice patient of Bon Secours. She died at the home her husband Joe had built on 13 Mile Rd in Roseville in 1947, on Wednesday, 13 March 1985 - the birth date of her beloved father. She was buried on 16 March 1985 at Resurrection Cemetery in Clinton Township beside Joe.